The decline of high street sales – Do you show-room? During the festive season, nearly a quarter of UK consumers used their mobile in-store to compare prices. A new survey from Foolproof revealed how popular show-rooming was in the run-up to Christmas, meaning that retailers will now have to come up with additional ways to persuade shoppers to make a purchase in-store, instead of online. The survey of 1,000 adults found that one in 10 bought from a competitor after comparing prices on their mobile. This new trend, unsurprisingly, seems to be more prevalent amongst younger shoppers, with 39% of 18-39 year olds show-rooming over Christmas, compared to 18% of shoppers over the age of 40. The rise in consumers show-rooming was expected, and is now seen as retailer’s biggest threat. Can the high-street prevent show-rooming affecting its sales? Various major US retailers in the US have already attempted to limit the impact of show-rooming by embracing consumers using the internet in-store. For example, Best Buy ran a price match guarantee which assured it would meet the prices of online retailers during the festive period. And Target used a QR code display where people could buy the top 20 toys online using their mobile, which meant they’d avoid queuing for ages and the toys were delivered for free. How about offering free in-store Wi-Fi? You may be thinking, well, offering free Wi-Fi just encourages customers to compare prices online. However, most customers will go online using 3G when Wi-Fi isn’t offered anyway, so by giving them access to free Wi-Fi, retailers can come up with ways to combat any online offerings. 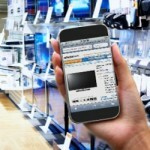 In an OnDeviceResearch survey, 74% of participants said they wouldn’t mind if a retailer sent promotional text or email if they were able to use in-store Wi-Fi, and Tesco offers free Wi-Fi for Clubcard members, which requires shoppers to enter their Clubcard details, so Tesco can send you special offers and discounts. I think offering free Wi-Fi is a sure-fire way to entice customers to step foot in the store in the first place, and as long as the retailer is able to take advantage of offering free internet, then the high street will be able to use show-rooming to its benefit. Do you think show-rooming is damaging to retailers on the high street? Would you be more tempted to visit a store if it offered free Wi-Fi?